I recently read McKinley's Beauty and thoroughly enjoyed it. Spindle's End is a retelling of the story of Sleeping Beauty. Again, I typically don't like Stories Re-Told but McKinley seems to have a way about her that I quite enjoy. Growing up little girls are told of the lovely fair maidens who are rescued by the handsome prince. Please do not misinterpret- I think those stories are charming and well-told. They are perfect in their place. McKinley just challenges the place. I was trying to figure out what it is about McKinley that I find so appealing. Perhaps it is that while most girls dream of growing up to be that rescued princess, we all, in part, doubt that we will be. McKinley's heriones are more "true to life" shall we say? I would also speculate that she leans towards modern day feminism which is attractive to females although not all together a good thing. McKindley's princesses are incredibly de-Disney-fied, no ringlets, chicks with attitudes females. Particularly her "Sleeping Beauty" (who sleeps for a period less than about 5 minutes, I'd say). There's more macho in the princess than silk and lace. This comes as a refreshment on the one hand, and on the other, it does give one pause. There's something elegant and mystical that is missing in McKinley's work that a girl just HAS to miss. Knights on white horses are dreams ingrained within the female race -- even though some women seem to howl in protest at the mere thought. We were created wanting to be rescued -- as well as wanting to take over. McKindley allows her princess to take over. It's an improper balance. I debated over whether or not McKinley is really doing us any favors with these modern day retellings. The romance and magic fades when the Princess (who chooses to go by the name "Rosie") runs around with hair cropped, in men's clothing and insists on being dirty. It doesn't really fit the mind's mold of "princess." Pushing out the male characters to lesser roles of lesser nobility and honor does tend to hurt the story in the long run. However, her characteres, for the modern day American woman, are more personable and enjoyable. It's much easier to believe one can be like Rosie as not. And perhaps that's where McKinley is useful. In today's day and age where women struggle with so many insecurities, its fun to get lost in a book that leaves you feeling like anything is possible and you too really CAN be a princess. It beats wishing for a pointy hat with silk dangling off the end of it. Although there is a time and place for silk as well. 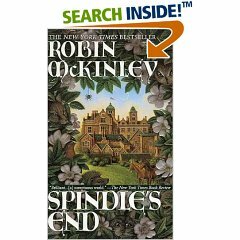 On the whole, I'd have to recommend Spindle's End and McKlinley's work in general. For the original idea. Yes, I've read Beauty and enjoyed it. I don't think I thought about as deeply as you did in your review of Spindle's End.